...Checked out a hotel downtown where we might do our room block & getting ready suite for the wedding. Normally I would have just checked it out online, but after counting how many people would have to be in the suite while we're getting ready, I had to make sure it would be big enough. While I was there I got to check out the gorgeous outdoor space on the river that will be an outdoor bar by the time of our wedding. Can someone say afterparty? ...Met up with some friends for a quick drink at Bureau Bar, which I previously didn't know existed. Yay for a new cute bar in our neighborhood! ...Since Jeff decided he's a futball fan now, watched an awful lot of soccer with him. The whole time all I could think of was this video with Jason Sudeikis. Your painting came out so good! Sounds like such a fun weekend!! Your painting is so gorgeous! We have something similar called 'Paint and Sip' in my area that my friends and I really want to go to. It looks like so much fun! I've only been to Bottle and Bottega once... for a friend's bachelorette party where we painted a naked man. It was hilarious particularly because of how awkward we all were. 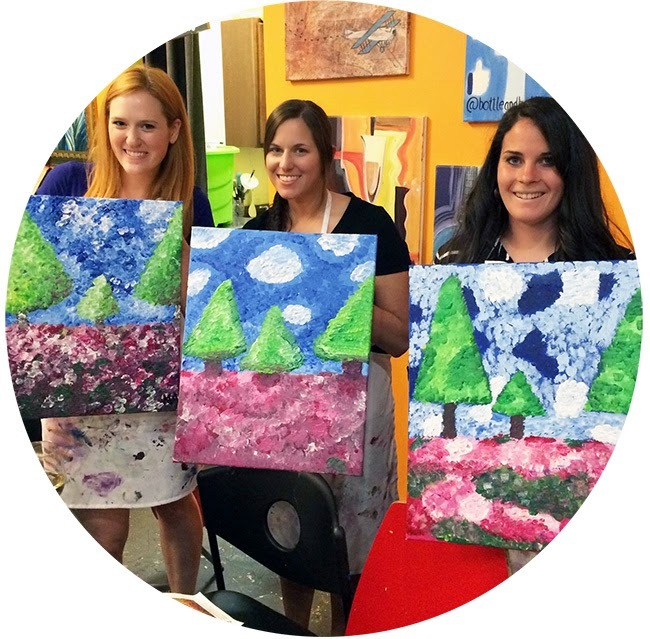 I suppose that painting trees would be less awkward but just as fun assuming there's wine involved. We're just growing up aren't we! Hahaha that's too funny! As I drank I just kept adding more and more paint, it took SO long to dry. You should! I've always thought about going and am glad I finally did, now I want to go back! Ha thanks Alyssa! I thought it was really good after several glasses of wine, now I may be changing my mind hahaha.